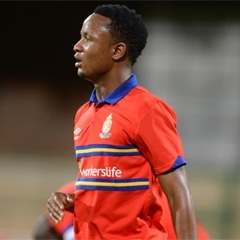 Soweto - Partson Jaure made up for a first-half blunder to secure a 3-2 win for the University of Pretoria over Moroka Swallows in a highly entertaining Absa Premiership encounter at Dobsonville Stadium on Saturday evening. Swallows built-up a two goal lead through Lerato Chabangu and Felix Obada and looked sure to put an end to their dismal run of form, but second-half goals from Atusaye Nyondo, Thabo Mnyamane and Jaure secured AmaTuks’ second win in succession, having beaten Ajax Cape Town 3-0 earlier this month. AmaTuks got off to the worst possible start as a poor back pass from Jaure found Chabangu, who passed the ball into the open net with only two minutes on the clock. It turned out to be a frustrating opening half for Steve Barker’s men as they failed to manage a single shot on target going into the break. Things went from bad to worse for the men from Tshwane seven minutes into the second stanza, Obada finishing off a superb team goal to double the hosts’ lead. AmaTuks were handed a life-line on the hour mark after Luvhengo Mungomeni was adjudged to have handled the ball inside the penalty area. Nyondo duly stepped up to score on his return to the starting XI. The goal sparked an incredible 22 minutes for the visitors, who grabbed the equaliser through Mnyamane in the 69th minute. The former NWU-Pukke striker ran onto a flick on from Geofrey Massa before firing past Greg Etafia, who had no chance. Jaure rounded off a stunning comeback for the visitors in the 83rd minute, the Zimbabwean centre-back deflecting Nyondo’s shot past Etafia to make up for his mistake in the first-half. The win sees them leapfrog Swallows and move into 12th place on the log standings while the Dube Birds slip into the relegation zone.